Canon will help signage and graphics producers to fuel new growth opportunities at FESPA 2019 and will demonstrate how improved operational efficiencies and higher margin applications can support evolving business models and enable access to new markets. Canon will inspire visitors with wide format digital print and automated workflow solutions, including the successful Océ Arizona flatbed series and the groundbreaking Océ Colorado printer featuring Canon UVgel technology. Displayed for the first time at an international event, the new Océ Arizona 1300 Series will be on show for visitors to see the flatbed printer live following its February 2019 launch. 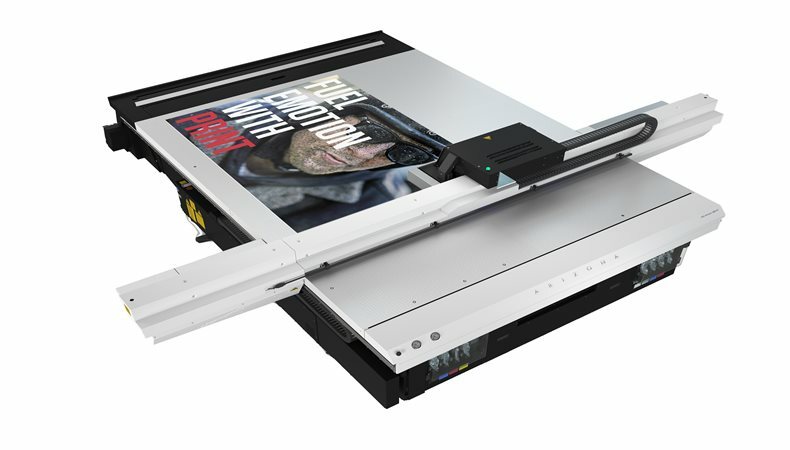 The Océ Arizona 1380 GT model will be on display at the Global Print Expo 2019 and will show customers how the technology enables them to produce an even broader range of applications working with almost any rigid or flexible media. The new printer will be demonstrated with Océ Arizona Xpert, an innovative software solution that simplifies and automates complex print jobs, including multi-layered and double-sided applications. Customers will have the opportunity to experience a range of textured applications printed live using Océ Touchstone, which is enabling many flatbed customers to deliver higher value applications reliably and cost-effectively. Examples that will be produced on the stand will include textured surfaces, embossing, metallic accents and raised lettering. Visitors to Canon’s stand will also see the Océ Arizona 6170 with High Flow Vacuum (HFV). This technology keeps challenging porous media such as corrugated board and plywood in place on the printer bed, reducing the need for manual operator intervention and assuring precise registration for superior quality prints. The ability to print efficiently onto rigid substrates enables customers to diversify into packaging, industrial and interior décor applications. The Océ Arizona 6170 with HFV will be printing POS displays and folded cardboard at the Global Print Expo 2019. Canon will have complete end-to-end solutions on show, including Océ ProCut, customers interested in optimising operational efficiency can see first-hand the next strategic steps Canon will be taking in automation. For visitors interesting in roll-to-roll technologies, the Océ Colorado 1640 printer with Canon UVgel technology will be a highlight of the Canon stand. The printer will be shown in an automated print and cut workflow with an inline solution from Canon partner Fotoba, feeding instantly dry printed output into the cutter device without any manual intervention, delivering a stack of cut prints ready for immediate shipment. Following the technology demo of this solution last year, Canon has worked closely with customers and Fotoba to optimise the product for high volume production, making it commercially available from the first day of this year’s event. The imagePROGRAF PRO-2000 24” large format printer will also be on display on the Canon stand, producing fine art and photographic prints, as well as outdoor applications, such as banners, using a water-resistant media. This will enable customers to broaden their product portfolio to offer prints that can handle wet weather conditions for up to six months for short-term, seasonal campaigns. There will be hourly live demos of all Canon solutions, inviting FESPA visitors to witness the productivity gains and diverse application opportunities enabled by the portfolio. Canon workflow and applications experts will be available throughout the Global Print Expo 2019 to show customers how to improve efficiency and differentiate their offering with new products and innovative business models. Canon will showcase a range of wide format applications to illustrate the emotional power of print and demonstrate how print can be a complementary channel to digital, providing consumers with a seamless and consistent brand experience. Visitors to the stand will discover an entire promotional campaign for ‘Speed’, a real coffee table book of lifestyle images captured by Horst A. Friedrichs and produced digitally on the Océ ProStream 1000 continuous feed inkjet press. Through a small bookstore simulation, visitors will experience a varied spectrum of promotional graphics and retail décor elements which together are designed to optimise the customer’s emotional engagement with the product. The printed ‘Speed’ applications include promotional and decorative posters, metal, canvas, wood, photo and fine art prints, floor and window graphics, as well as POS displays. Together these demonstrate how brand owners can use high impact wide format print to fuel emotional engagement, engage consumers, improve retention and elevate response. FESPA Global Print Expo 2019 is Europe’s largest speciality print exhibition for screen and digital wide format print, textile printing and signage solutions. Visit Canon at stand E30 in hall B5 at the Messe Munich between the 14-17 May 2019 and discover the available features. Please use promo code FESG902 to register for free.